In the Linked Earth context, a working group (WG) is a self-organized coalition of knowledgeable experts, whose activities are governed herewith. 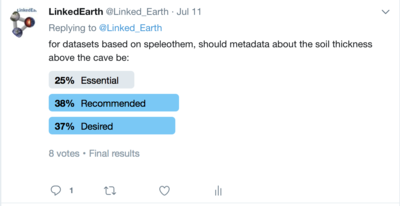 This page is dedicated to the discussion of data and metadata standards for speleothems, and aims to formulate a set of recommendations for such a standard. This working group has 4 members. provide an ideal data table (or link to one) for each type of observation, so the community knows what to report and how to report it. There were 3 votes since the poll was created on 02:07, 9 May 2017. There were 3 votes since the poll was created on 14:37, 24 April 2017. 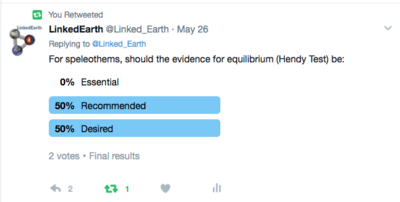 There were 3 votes since the poll was created on 13:29, 20 April 2017. There were 3 votes since the poll was created on 13:30, 20 April 2017. There were 3 votes since the poll was created on 13:31, 20 April 2017. Please see the chronologies WG for generalities about U/Th dating or layer-counting. 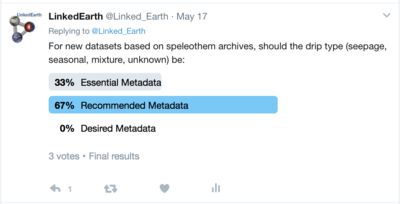 If challenges specific to dating speleothems exist, please list relevant metadata properties below. There were 3 votes since the poll was created on 14:52, 24 April 2017. There were 3 votes since the poll was created on 14:58, 24 April 2017. There were 2 votes since the poll was created on 14:59, 24 April 2017. There were 3 votes since the poll was created on 14:59, 24 April 2017. 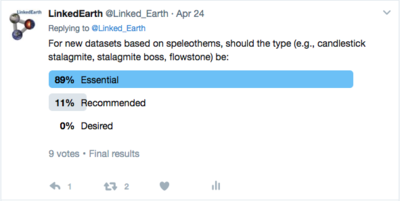 There were 3 votes since the poll was created on 15:00, 24 April 2017. 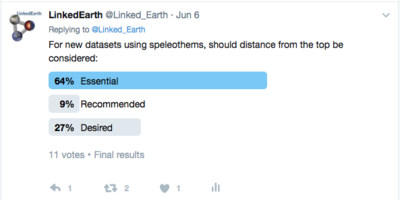 The interpretation of geochemical or lithological signals embedded in speleothem archives relies sometimes heavily on implicit assumptions about cave hydrology. 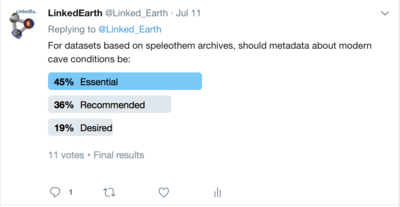 What parameters need to be archived to enable long-term re-use and better information extraction from speleothem datasets? There was one vote since the poll was created on 15:54, 24 April 2017. There was one vote since the poll was created on 15:55, 24 April 2017. 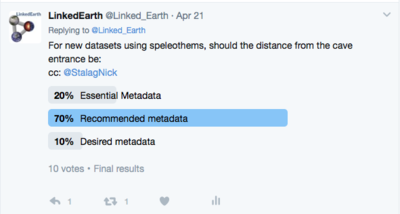 There was one vote since the poll was created on 16:37, 24 April 2017. 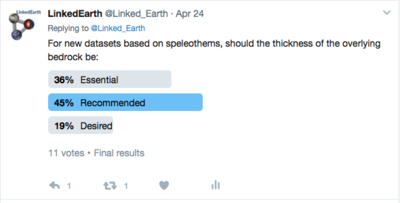 There was one vote since the poll was created on 16:38, 24 April 2017. There was one vote since the poll was created on 17:06, 24 April 2017. There was one vote since the poll was created on 17:07, 24 April 2017. This page was last modified on 19 July 2017, at 14:08.